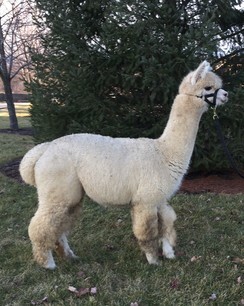 Quechua Verticase is an elite male sired by the late Snowmass Quechua. Quechua was a legend of his own, awarded multiple consecutive years with the prestigious title of Futurity Herd sire of the Year. Verticase has the genetics to boost being one of the most Elite Herdsires in our Industry today. Upon reviewing his pedigree you will find the names of most of the top Herdsires in U.S. history…Peruvian Hemingway, PPeruvian Caligula, 6Peruvian Accoyo Elite, Snowmass Ccatanca, and PPeruvian Vengador. Herdsires like Verticase are few and far between and rarely parted with. Verticase has multiple Champion offspring to his credit. He is the herd sire you are looking for. “Prepotency is an alpacas’ ability to pass on heritable phenotypic traits that it possesses without regard to environment or selected mate.” Verticase has proven this theory many times. Give us a call – Verticase will be back in PA this spring. She's A Lady is a beauty! We decided to pick up Lady in NY @ the Empire. To be able to have her on site she had to be registered for the show - She took the Blue! Her conformation and outstanding fleece is exactly what you want in a foundation female. Her sire, Simba has 9 championships to his credit with an additional 12 Get-of-Sire Championships. The 12 Get-of-Sire championships is a clear cut indication of the quality this dam comes from. She's A Lady sold well @ the Breeders Edge Auction. During the time Lady was gone, she delivered an amazing Quechua Verticase daughter, Alleghenies' Amelia. What the quality of her offpsring proved was that regardless of the herd sire, Lady's cria were gorgeous; fine fleece, well structured fleece and density "off the charts". When Lady, Alex and cria were again available for sale, we jumped at the opportunity to purchase Lady & Crew back. Lady has delivered an Accoyo American Alpha cria 5/17/17. There is something to be said about a dam that needs no assistance in birthing and caring for her offspring. Here are the facts according to AOA. Alpha has won more Color Championships than any other white male in 2014 (5). He is the only white male to win The RAC in GA twice (2013 & 2014). This alone has put him above most white males but what has put him at the top is the fact that he has won these Color Championships at 6 yrs old. The judges have spoken and it is all about his lingering finest at this age. It is our opinion that he keeps getting better and the championship banners agree. Now is your chance to add this phenomenal male to your bloodlines. Content copyright © VAOBA and it's respective members.